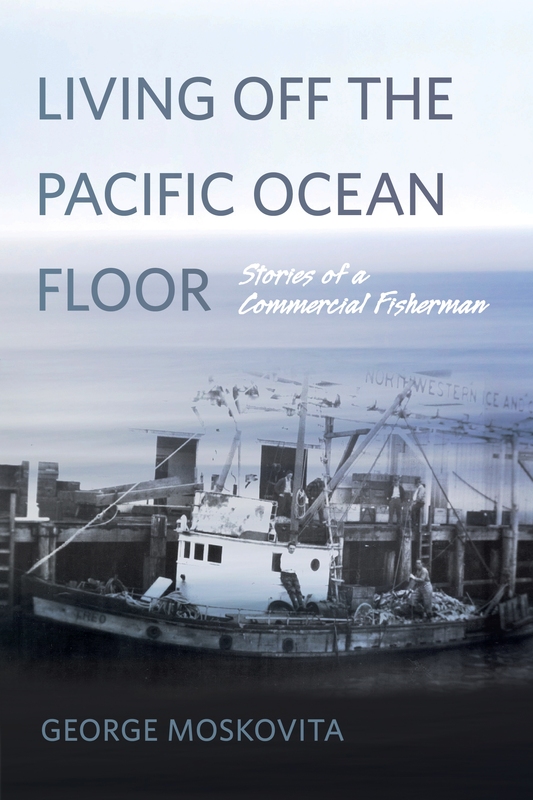 Faithful readers will know how excited we are that Oregon State University Press will be republishing Living Off the Pacific Ocean Floor, George Moskovita’s memoir about his five decades fishing on the West Coast. It is set for publication this fall and the Press has just released this wonderful cover image. We think the picture better conveys the story that George tells, about the grueling and dangerous work of fishing in the 1930s and 1940s, before technology revolutionized fishing, greatly adding to the ability of fishermen to find and catch fish. The photograph on the original cover, of George standing on the cod end, having caught 150,000 pounds of POP, was certainly eye-catching. But this image is more evocative of the story and George’s hardscrabble race to wrest a living from the Pacific Ocean floor. It was difficult and dangerous work. George and his father, Dome Moskovita, had been located in Bellingham, where George was born. The family moved to Astoria in 1939. Dome Moskovita owned the New Zealand, and George bought his first boat, the Treo. As Dr. George Yost Harry tells us, these were two of the four boats that started the trawl fishery in Oregon. George had been a deckhand, purse seining for salmon in Alaska, sardines off California, and tuna off Mexico. He’d scraped the money together to buy the 55-foot Treo, an old wooden boat with a gas engine. There were no controls in the pilot house, just a bell to signal the crewman in the engine room to put the engine in or out of gear. It’s likely that he just intended to set crab pots near the mouth of the Columbia River, dangerous enough for an old boat designed to purse seine in the sheltered waters of Puget Sound, not to drag nets in the open ocean. The only market for trawl-caught fish was the mink farmers and they paid less than two cents a pound. The dogfish were plentiful, as shown in the cover photograph. But it was dangerous work. George opens his memoir with the harrowing story of the Treo sinking off Peacock Spit, and George and his crewmen barely escaping with their lives. We are very pleased that this wonderful addition to the literature on the development of fisheries in the Pacific will be more widely available. [i] George Moskovita, Living Off the Pacific Ocean Floor. (Corvallis: Oregon State University Press, Fall, 2015). This entry was posted in boat building, California sardines, Carmel Finley, Environmental History, Fishing, George Moskovita, History of Science, History of Technology, Maritime History, Ocean fishing, Oregon pilchards, Overfishing, Pacific Fishing History Project, Rachel Carson Center, Rosefish, Sebastes rockfish, Soviet environmental history, Soviet fishing, World History and tagged groundfish, Pacific Fishery History Project, trawling. Bookmark the permalink.